No executive would dispute that analysts’ forecasts serve as an important benchmark of the current and future health of companies. To better understand their accuracy, we undertook research nearly a decade ago that produced sobering results. Analysts, we found, were typically overoptimistic, slow to revise their forecasts to reflect new economic conditions, and prone to making increasingly inaccurate forecasts when economic growth declined. Moreover, analysts have been persistently overoptimistic for the past 25 years, with estimates ranging from 10 to 12 percent a year,4 compared with actual earnings growth of 6 percent. Over this time frame, actual earnings growth surpassed forecasts in only two instances, both during the earnings recovery following a recession. 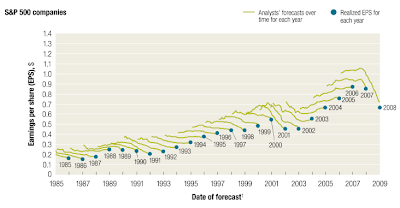 On average, analysts’ forecasts have been almost 100 percent too high. Here are my Five Reasons Explaining this Phenomenon. * Analysts do not do their homework on what is really happening and why. Instead they see rising earnings and take them at face value, nearly always figuring following quarters will be better yet. * Analysts do not understand the dynamics of debt deflation, peak credit, the baby boomer retirement dynamics, etc. In short, Analysts do not understand the global macro picture is bleak. * Analysts look at a steep yield curve and think the Fed can lift the economy. * Analysts have not yet caught on to the fact that consumer spending and bank lending attitudes have changed for good. * Analysts in general have a vested interest in getting the public to buy stocks, annuities, etc. because that is how they make money. Given that debt deflation, and attitudes were not issues in many past blown estimates, a second look suggests points #1 and #5 (especially 5) are the real reasons in play. Regardless of the reasons, the key point is forward earnings estimates have been ratcheted up several times in the past year and are now wildly optimistic. I don't believe them and history suggests you should not either. Do analysts get paid a rather lot of money to provide over optimistic expectations. I suppose once you start being over optimistic you keep on being over optimistic. Wasn't there a psychology study showing that pessimists make better predictions in general? Its amazing how these sell side cretins get away with it. There must be a case for criminal prosecution based on all the lies and manipulation.